Configure the TP-Link TL-MR3220 Wireless N Router to connect using WDS wireless bridge with another wi-fi router for internet connection sharing. Bridging two wifi routers together so that they share an internet connection is tricky business. Sometimes it works the first time. The next time, the two routers are still connected but no internet comes through. Repeating the configuration process over and over again does not help. In some days, internet comes through.This could be the case with two wireless routers that are located 75 feet apart between households, or between two adjascent households with the wifi routers behind walls. It's never a sure thing. It does not work 100% of the time. To make sure that the following procedure works, place the wireless routers to be bridged in line of sight of each other or as favorably within strong signal range of each other as possible before placing them in their final locations for regular use. The Wireless distribution system (WDS) must first be enabled and configured within the web admin interface of the TP-Link TL-MR3220 Wireless N Router. From your computer, cellphone, or tablet, make sure you are connected to the TP-Link TL-MR3220 Wireless N Router via network cable or wirelessly. In the web browser, go to http://192.168.0.1. This is the default LAN address of the TP-Link TL-MR3220 Wireless N Router. The default user is admin and the password is admin. This is how the router admin interface looks. your router LAN address has been changed. In this case, go to that address. your computer IP address is not in the same network IP range as the router. In this case, 192.168.0.x. This is especially true if the computer was automatically assigned an IP address by a DHCP server somewhere else in the network, not the TP-Link TL-MR3220 Wireless N Routers' DHCP server. You can temporarily configure your computer network adapter to have an IP address that is in the same network IP range as the router. In the network adapter properties, set the IPv4 address manually to 192.168.0.100, for example. In the menu, select Wireless > Wireless Settings. Tick Enable WDS Bridging. Click on Survey button. Wait for a few seconds while the router scans for available wireless networks. A page listing the detected AP networks loads. Some AP routers do not have SSID names and will show blank under the SSID column. For internet connection to work, the signal quality level, not the signal strength level, of the router that you are connecting to should be good enough. You may be able to connect with a strong signal, but if signal quality is low, your computer will be unable to access the internet. Select the other wifi router you wish to share internet from by clicking its respective Connect button. You will be taken back to the previous page with the BSSID and SSID fields filled up automatically. For a hidden wireless access point, you have to type the SSID manually. For Key type, it is recommended that the security type is the same as your AP's security type. In most cases, it is WPA-PSK/WPA2-PSK. Select None if it is an open access point. Type the password of the AP router that you are connecting to in the Password field. Click Save button. This will save the settings but will take effect only after the router is rebooted. In order for the client connecting to the TP-Link TL-MR3220 Wireless N Router, be it a computer, tablet, or cellphone, to have internet, it must receive the proper IPv4 settings automatically from the DHCP server within the other network where the other router is connected to. We need to turn off our router's DHCP server since another one up the network hierarchy is already running. In the menu, select DHCP > DHCP Settings. In DHCP Server:, select Disable. Reboot the router for the settings to take effect. In the menu, select System Tools > Reboot. Click Reboot button. When the router has rebooted and the router status page has loaded, let the page automatically reload itself until you see the Run status in the Wireless section. If the status is Scan..., Join..., and Run does not appear, the router has failed to make the wireless connection to the other AP router. Move the router to a better location until the connection is successful. Proceed to the next step. In Windows Vista or Windows 7, make sure that the network adapter is set to Obtain an IP address automatically so that when it makes a connection to the other access point router, it can receive the proper IPv4 DNS and IP settings for the internet connection. If the wireless connection to the other router is poor, the network adapter will take a long time to receive the IP address and will get a wrong one! Select Open Network and Sharing Center when r-clicking the network icon in the system tray. Click Change adapter settings on the left column menu. A list of network connection devices appears in the next window. R-click on the network device that you will use to connect to the TP-Link TL-MR3220 Wireless N Router and select Properties. In the item list window that appears, double-click on Internet Protocol Version 4 (TCIP/IPv4). Make sure Obtain an IP address automatically and Obtain DNS server address automatically are ticked. Click OK button. The network adapter will restart the connection. If successful, the Internet icon will appear. Open Network and Sharing Center. It should display the network name of any of the two connected routers, not Unidentified Network. 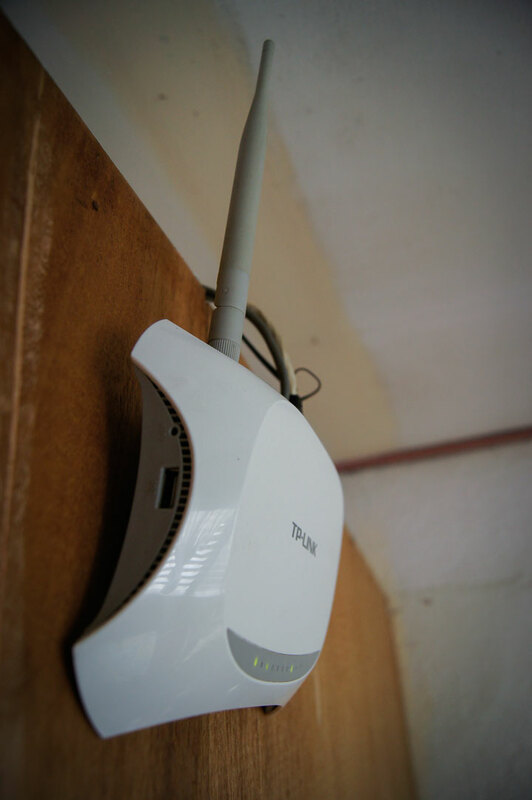 Connect directly to the access point router using a wireless device such as a tablet or cellphone. Test the internet in the device by visiting a website. The access point router device icon may show up in the Network browser window. Ping the internet modem if you know its IP address in the network. In the cmd window, type ping 192.168.254.1, for example.